Lady Wonder a mare owned by Claudia Fonda of Richmond, Virginia, allegedly had psychic abilities. When Lady Wonder was two, she astonished everyone by showing how she could count and spell out simple words by moving toy blocks around with her nose and hooves. As they continued to work with her, she progressed in her grasp of both the English language and in her ability to read people’s thoughts. Eventually the wooden blocks were replaced with tin plates with letters, and when people asked Lady Wonder questions, she would respond by using her nose to turn up the letters of a big tin alphabet which hung suspended from an iron bar in the stall. By flipping the letters, she would eventually spell crude simple responses to any questions asked. A spectator took a coin from his pocket. None saw the face of it but he. What was the date on it? The mare nosed over the blocks, “1-9-1-4.” Correct. “Who in the group has on a pink dress?” the mare was asked. “As I live!” exclaimed the woman in pink as the mare thrust her head emphatically in the visitor’s direction. A spectator picked up the clock and turned the dial to ten minutes past six. Nobody saw the figures but he, and he thrust the clock face against his body. “What time is it by this clock?” the mare was asked. “Six-one-naught,” replied Lady. When she noses among the blocks, spelling out the answers, she appears to be going to sleep. Her eyelids droop heavily, and her head is sagging indolently. Only when the experiments are over does she resume her character as a tense, nervous offspring of a race horse. In Dec 1928 parapsychologists Drs. J.B. Rhine, Louisa Rhine, and William McDougall, came to the stable owned by Mrs. Fonda and conducted several hundred tests with Lady Wonder. For example, Dr Rhine wrote on a paper the words Mesopotamia, Hindustan and Carolina and, keeping the words out of sight, said “What are the words I have written Lady?” The horse immediately ‘nose-picked’ them with out an error. Several baffled scientists and psychologists of the time studied Lady Wonder, convinced that the whole thing just had to be a hoax. Or if not a deliberate hoax, then surely either Mrs. Fonda or the people who asked the mare to answer questions must be giving her visual cues that she picked up on. It must be said that Dr. Rhine, a botanist heavily influenced by the spiritualist author of Sherlock Holmes, Sir Arthur Conan Doyle, investigated the abilities of Lady Wonder concluding that there was strong evidence for telepathy between human and horse. Rhine is known fpr founding the Parapsychology Lab at Duke Univeristy and the Journal of Parapsychology, but is probably best known as the originator of the phenomenon he coined; Extra Sensory Perception (ESP). The prominent illusionist Milbourne Christopher attributed the phenomenon to ideomotor reactions, which are those motions that are made unconsciously. Christopher’s view was quite contrary to the para-psychological explanation and was able to determine that that Lady Wonder only answered questions correctly when her trainer was aware of the answer, much like in the case of the Clever Hans. Although Christopher had pointed at ideomotor reactions, similar to those which guided Hans to answer his questions, Mrs. Fonda continued charging a dollar for three answers for the abilities of Lady Wonder. She was also believed to solve some mysteries, and was asked assitance in solving the case of a missing boy named Ronnie in 1955. While Hans, together with Eberfeld horses, caused a sensation in Europe during the turn of the century, with their incredible abilities, across the Atlantic, another sensation was drawing attention. Jim Key, under the direction of Dr. William Key, was known for his abilities in reading, writing spelling, time-telling, simple mathematics, sorting out mail, and even citing passages from the Bible. 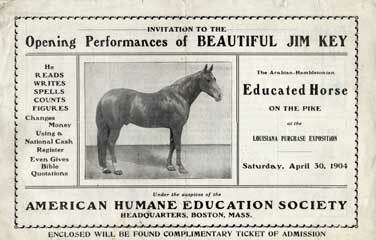 Unlike Clever Hans, or the Elberfeld horses of Europe, the story of Beautiful Jim Key has gone largely unnoticed through the years, despite the fame of his heydays. His story has recently been revived by author and writer David Hoffman, and retold in a wonderful book; Beautiful Jim Key by Mim Eicler Rivas. Show your support by sharing our work with family, friends and colleagues! Much appreciated!! Tarpan: A “Heck” of a story. The art of over-simplifying an over-simplification! Horse behaviour: generalizations from observations of one population?